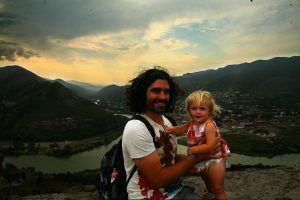 Independent day trip to Mtskheta from Tbilisi. Visiting monasteries. To be in Tbilisi and not pay a visit to Mtskheta is a crime. 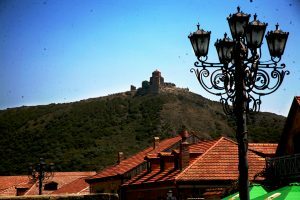 Located only about 20 km out of the capital, Mtskheta makes it a perfect 1-day getaway trip from busy Tbilisi. 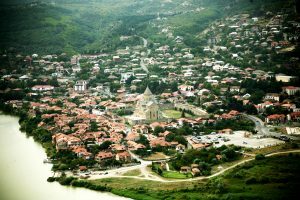 So why is Mtskheta so important that it is an absolute must see in Georgia? Well, let’s just say that Mtskheta is one of the world’s 15 most ancient cities (1100 BC) and it used to be the capital of the eastern Georgian Kingdom of Iberia from the 3d century BC to the 5th century AD. 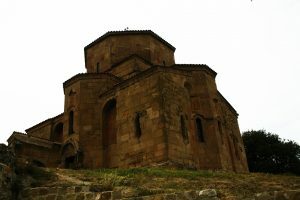 Also it is THE place where Christianity was adopted as the state’s official religion in Georgia in 334 AD… Which is one more point of interest for those who are especially keen on Orthodox Christianity. On top of that the most sacred place in Georgia, Svetitskhoveli Cathedral along with Jvari monastery are located in Mtskheta. Both of them are incredibly beautiful. Now you see? Give it a go if you have a spare day in Tbilisi. Nowadays Mtskheta is a lovely little town with cute narrow cobblestone streets and lovely houses. 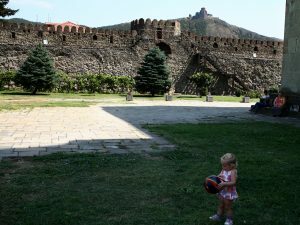 If you are tired of loud Tbilisi, Mtskheta with its laid-back atmosphere is a place to be. The cathedral is located in the middle of the town and if you come by public transport it is just a short walk from the main street. It is huge, central and impossible to miss. The cathedral itself is splendid! 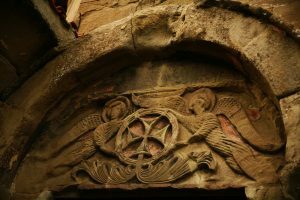 It was built in 1010 AD on the site of Georgia’s first church and contains many graves of ancient Georgian kings, including Sidonia who is said to have been buried holding Christ’s robe…or so the legend goes. Whether you are a believer or not, it is impossible to stay unmoved by the cathedral’s dazzling beauty: all the paintings, frescoes, icons, graves of the kings, built-in chapel (a symbolic replica of the Chapel of Holy Sepulchre in Jerusalem), and decorated pillars make the Svetitskhoveli Cathedral a true work of art. The entrance to the cathedral is free of charge. Women should wear pants or long skirts and the head should be covered as well. However if you are not appropriately dressed you can borrow skirts and scarfs at the entrance to the cathedral. For free. Traveling with a baby I must say that visiting Svetitskhoveli Cathedral was a pleasure. The area around it is huge and there was plenty of shade for us to relax and for our baby Lia to run around. I think we spent more than one hour just resting and watching people at its premises. Outside of the cathedral there is an information office, bathroom, little supermarket and a promenade street full of stalls with Georgian delicacies and souvenirs. Another not-to-miss spot while in Mtskheta is Jvari monastery. It is located in an absolutely jaw-dropping spot, on the hilltop overlooking Mtskheta at the meeting of two rivers, Mtkvari and Aragvi. According to the inscriptions on the façade, the monastery was built between 590 and 605 AD. And since 1994 it is a UNESCO World Heritage Site and once you are there you can see why. How to get to the monastery? There is no public transportation from Mtskheta to Jvari monastery so most people take a taxi to get there. Taxi costs about 12-15 GEL for round trip and about 30 minutes waiting time. The price is for the whole car. Warning!!! It is not the type of park with alleys, benches and ice-cream stalls, it is more like a green area of the city not very suitable for family hangouts. We also saw multiple paths from the hilltop and the hike didn’t look challenging at all. Quite the contrary it looked like a nice and beautiful stroll. If you decide to take a walk to Jvari monastery, make sure you have you offline map application MAPS.ME. It is a wonderful app that shows you all the paths, hotels, restaurants, bus stops, points of interest and so on. Also you can download just a country or a province where you are currently in and then delete it as you move on to another pace. In this way, the maps.me doesn’t occupy much space on your phone. Personally I like it even more than Google maps. Mtskheta is easily accessible by public transportation being located only 20 km from Tbilisi. Mini buses run regularly from Didube bus station that is located at the Didube metro station (metro is only 0.50 GEL). When you exit the metro station, head through a tunnel that will lead you to a market/bus area. In that mess you have to find your minibus (marshrutka). I suggest writing down the name Mtskheta on the paper or show it on the map and people will point you in the right direction. Most likely you will be approached by taxi drivers so say firmly “marshrutka” and move on. Also, look out for the sign “Mtskheta” on the windshield of the minibuses. “Mtskheta” is written in Latin letters therefore it makes it easier to find a right one. Once you find the right place, there is a stall with a cashier where you can purchase your ticket (1 GEL) or you can pay directly to the minibus (marshrutka) driver. 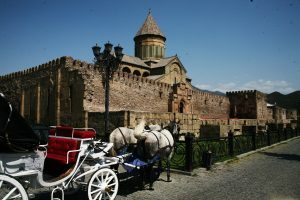 Once in Mtskheta ask the driver to stop at the Svetitskhoveli Cathedral. You will still have to walk some but in this way you’ll get out in the city center and not at the bus station, which is north of the town. My bet is that half of the marshrutka will get out in the city center so you shouldn’t miss it. Once again you can follow your GPS location via offline MAPS.ME and in this case you’ll know for sure what is going on and whether it is time to get out or not. To come back to Tbilisi take the same marshrutka. It stops at the bus stops or you can just flag it down on the road. Remember to ask whether it goes to Tbilisi…most probably it does but just in case. Stay overnight in Mtskheta. Our biggest regret was that we made it a 1-day trip. The city is splendid, calm and green…perfect getaway for families with children. Prices for hotels/hostels and restaurants are cheaper than in Tbilisi so it makes it even more sense to spend a night in Mtskheta to properly enjoy it. There are banks, pharmacies and little supermarkets in the city center where you can get basic stuff including baby products: diapers, formula, baby jars etc. The prices are slightly higher than in Tbilisi and the choice is smaller, but still something. Check the weather before coming to Mtskheta, the view from Jarvi monastery is the best when it is clear outside. 12 GEL taxi to Jvari monastery (price is for the whole car so divide it between people you are with). Free if hiking.